14 films by one of Britain’s greatest documentarists, offering a fascinating insight into his early years in film. 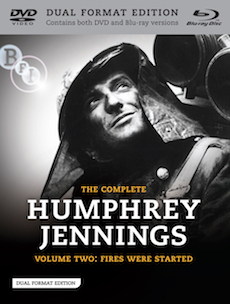 Widely considered one of Britain’s greatest documentary filmmakers, Humphrey Jennings has long been critically acclaimed for films which beautifully evoke everyday heroism in times of war and peace. Combining poetic observation and humanism with a subtle yet intense national feeling that is also very personal, Jennings was a visionary and progressive patriot in the tradition of Williams Blake and Morris. 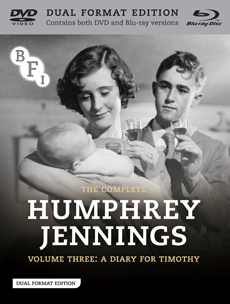 This, the first of three volumes which collect together Jennings’s entire output, gathers 14 films from the period 1934-1940 and provides a fascinating insight into Jennings’s early days as a filmmaker learning and developing his craft. It features the critically acclaimed Spare Time and London Can Take It! as well as some previously neglected works, many of which will be available for the first time since their original release. The Birth of the Robot (1936): a Len Lye film for Shell on which Jennings collaborated. English Harvest (1939): an alternative cut of The Farm. Cargoes (1940): an alternative cut of SS Ionian. Britain Can Take It! (1940) an alternative cut of London Can Take It! Illustrated booklet with newly commissioned essays and film credits. Second volume of films by one of Britain’s greatest documentary filmmakers, a lyrical portrait of the nation at war.